The Hochschild Collection of Highly Important English Furniture, sold Sotheby's London, 1 December 1978, lot 20. Purchased from Partridge Fine Arts, London, 1980. These magnificently carved George II 'term fashion' torcheres are in the 'antique' manner and served as pedestals for candelabra or flower vases, and often accompanied a pier-table or commode-table. They evolved from terminal posts, dedicated to Roman dieties, and relate to some garden terms designed around 1620 by the Palladian architect Inigo Jones (d. 1652) for Thomas Howard, 2nd Earl of Arundel. These, in turn, inspired Chiswick Villa's stone terms, designed in the 1720's by Richard Boyle, 3rd Earl of Burlington and his architect William Kent (d. 1749). A drawing by the architect John Vardy (d. 1765) for a term figure of about 1745, relates to the overall design of the present lot, as well as to a number of other similar sets of pedestals generally attributed to Kent, who was architect to George II. Vardy was closely associated with Kent, and published some of the latter's designs in a book entitled Some Designs of Mr. Inigo Jones and Mr. William Kent in 1744. The Vardy drawing is closest in design to a pair of pedestals at Longford Castle, Wiltshire, and which were likely to have been executed by John Vardy's brother, the carver Thomas Vardy. Benjamin Goodison (d.1767) had premises at the 'Golden Spread Eagle', Long Acre, London, and records indicate that he was probably apprenticed to James Moore in 1720, but this is not recorded. It is assumed that Goodison succeeded Moore in royal service in 1726-27 and from the late 1730's recieved payments from the Great Wardrobe along with Kent and others. (G. Beard and C. Gilbert, eds, The Dictionary of English Furniture Makers 1600-1840, Leeds, 1986, pp. 351-352). During his career Goodison supplied furniture not only to to the Royal Palaces, but also to illustrious private houses such as Holkham, Longford Castle, Deene Park and Alnwick Castle. It is Goodison's delivery of a pair of George II Ionic-capped 'nymph' pedestals to Hampton Court under the direction of Kent in 1732-1733 that connects him particularly to the pedestals offered here. While numerous variations on the general design exist, including putti or male figures supporting stepped platforms, some with winged figures or acanthus carving and varied forms of base, these torcheres compare most closely with the Hampton Court pair. Both sets have a female drapery-clad torso, trailing bellflower husks against a fish-scale ground, and four scrolled feet. This pair is further distinguished by the beauty of the female terms and their trailing curled hair which is not seen on any of the other examples. Additional similar models are at Chatsworth and the Victoria and Albert Museum, illustrated in D. Fitzgerald, ed., Georgian Furniture, London, 1969, pl. 28 (W.47-1962). 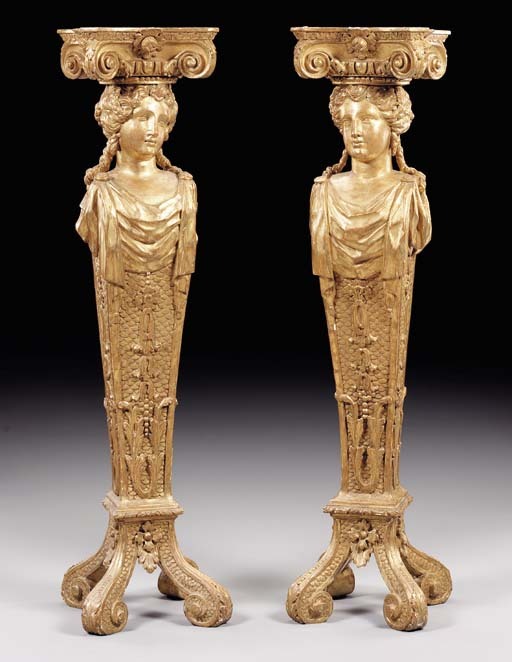 A further related pair of pedestals were sold anonymously, Christie's London, 5 December 1991, lot 221. Elvaston Castle has been in the Stanhope family from the 16th Century. The succesive Earls of Harrington devoted themselves to a series of rebuilding and refurnishing, following the lead of William Stanhope, who was created first Early in 1742. These torcheres are likely to have been commissioned by William Stanhope, 2nd Earl of Harrington (d.1799) around the time of his marriage to Lady Caroline Fitzroy in 1746. They were removed from Elvaston Castle and sold by the Rt. Hon. Earl of Harrington, Sotheby's London, 8 November, 1963, lot 166. Also sold in the 1963 sale were a pair of George II giltwood chandeliers which were sold anonymously, Christies New York, 17 October 1997, lot 422, as well as a pair of George II giltwood mirrors, sold Christie's New York, 12 April 1996, lot 58.